Make a Great Risotto in 5 Simple Steps, 3.6 out of 5 based on 8 ratings If you’re lucky enough to own a pressure cooker, we’ve also got a fantastic recipe for Mushroom Risotto! Conjuring up risotto at home has become a favourite pastime for ambitious cooks, as it takes skill and a lot of patience to perfect the process. But the good thing about risotto, aside from its wonderful flavour, is that you can customize it accordingly and experiment with various risotto recipes – put in baby greens for vegetarians or include shiitake mushrooms if you want an Oriental twist. As an added bonus, it's not only exceptionally tasty, it's chock-full of carbohydrates, vitamins, minerals and other nutrients. Keep the stock hot on a separate burner by allowing it to simmer over a low flame. In a deep pan, heat the olive oil or butter on medium heat. Add the onions and garlic until they are translucent but not browned. When the onions and garlic have softened, turn up the heat and add the rice. The grains should sizzle when hitting the pan. Keep stirring the rice to prevent it from burning; use a wooden spoon as it allows the rice to stick together more. When the rice begins to look translucent, pour in the wine. Keep stirring and wait for the wine to evaporate. After the wine has been absorbed, pour in the hot stock one ladleful at a time. Turn the heat down low so the rice simmers but doesn't burn. Allow the stock to be absorbed by the rice before adding the next ladleful. Continue stirring and gently mashing the stock into the rice until the rice is cooked. Should you run out of stock before then, use boiling water with a pinch of salt instead. 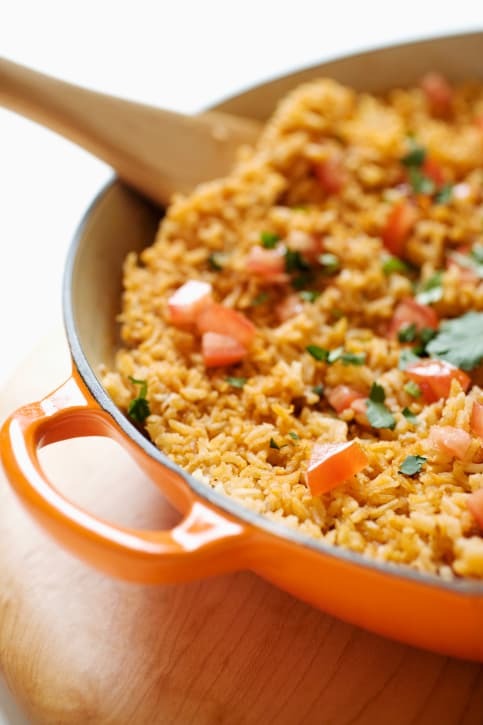 The cooked rice should be soft but remain al dente – a firmness that would seem underdone in rice cooked normally. Remove the pan from the heat. Add the unsalted butter and Parmesan and mix thoroughly. This is called mantecatura – beating in the butter and cheese, which is important to the risotto's rich texture. Put in additional seasonings at this stage, taste to check and serve while hot. Risotto recipes with extra ingredients call for aromatic add-ins like mushrooms or shallots and hard-to-cook vegetables like celery to be fried at the beginning with the onions and garlic. For vegetables and seafood that are faster to cook, you can add them with the stock and allow the pieces to steam along with the rice. Vegetables like asparagus tips should be added at the last-minute to prevent them from getting overcooked and tough.